After one year in operation Brisbane’s public bicycle hire scheme, CityCycle, is not doing so well. For most of the year the usage rate has been approximately 0.3 trips per bike per day. Compare this to other schemes such as London, Paris or Dublin and it becomes quite clear that there is a problem with Australia’s public bike schemes. There is only one other bike hire scheme that is performing as poorly as Brisbane’s scheme – Melbourne Bike Share. It is also subject to Australia’s strict all-age mandatory bicycle helmet law. Apart from the footpath and cyclepath exemptions in The Northern Territory, all Australian states mandate the wearing of bicycle helmets for all persons at all times while straddling/riding a bicycle. Both our peak bicycle advocacy organisation in Brisbane (Bicycle Queensland) and the Lord Mayor have stated that helmets are an issue for CityCycle. However they see no problem with bicycle helmet laws at all, unlike the rest of the world’s bicycle advocacy organisations and the CEO of JCDecaux in Australia, Steve O’Connor. No, our ‘cycling experts’ see it as a problem of ‘helmet availability‘. As a result they cooked up a solution to fix the problem once and for all. 400 courtesy helmets were attached to the bicycles so there would be no excuse. Unfortunately they forgot that there were actually 1000 bicycles in the system so not all bikes had helmets and occasionally a station would be devoid of any helmets. So, how did this improve CityCycle’s usage? Trips rose by a whopping 30%! Fantastic! Actually, it’s pathetic. A 30% rise in trips means that we are now seeing a usage rate of 0.4 trips per bike per day (instead of 0.3). The Executive considered the issues of whether bicycle helmets should be compulsory at its June 2011 meeting where it decided that, considering the Council’s starting point is to favour individual choice, there was insufficient evidence to justify making bicycle helmets compulsory as opposed to seat belts where the evidence is overwhelming. 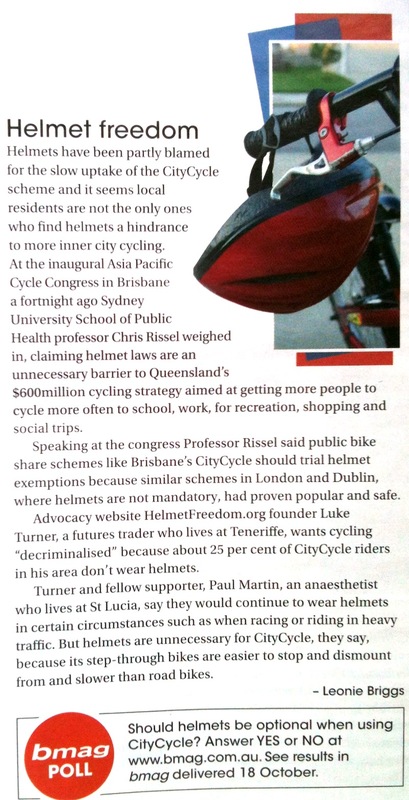 HelmetFreedom.org was invited to speak with the council in early September and we were well received. Watch this space. We have also seen a significant Change of Tune from a prominent cycling journalist in Melbourne, Wade Wallace. He had previously been a strong supporter of bicycle helmet legislation but, after having seen what we could have when cycling in Europe, he’s decided that we really need to do something about this particular law. It was a stunning change of heart and a well written article. He should be commended for writing it given the current climate of cycling in Australia. There have also been more vocal calls for a helmet exemption trial for bike share bikes, something we’ve been requesting for some time now. Currently Brisbane’s CBD BUG (Bicycle User Group) is running a poll on the bicycle helmet law. The accompanying article is well written and it highlights the important point of this entire discussion: it is the bicycle helmet law that is being questioned, not bicycle helmets. Why should cyclists in Australia be subjected to verbal abuse for not wanting to wear a bicycle helmet at all times? It’s about time we decriminalised cycling in this country. Follow us on Twitter (@freecyclists) and like us on Facebook and spread the word. Add your voice to the growing chorus on the GetUp! Campaign Suggestions Forum, vote up the suggestion or just leave a comment. Talk to your local state politicians about it. How safe is cycling in Australia? Who is taking the greater risk here? Bike riding in Australia has long suffered from a severe crisis of identity, at the hands of our state and federal governments. The message could not be clearer: cycling is dangerous. Even for short rides on quiet streets, it’s only a matter of time before you have “the big fall”. On the other hand, these very same governments (and even at times the same government departments) are trying to promote cycling as a healthy and beneficial activity – not just something to be tolerated, but something which should be actively encouraged for everyone. The Queensland Government maintains a list of the health, social, economic and other benefits of riding a bike, and makes no mention of the risk of “a big fall” or any other type of injury. Misconception 1: Cycling is dangerous, with or without a helmet. Given the disproportionate emphasis on the dangers of cycling in helmet promotion campaigns it is unsurprising that many Australians believe riding a bike is an especially risky or reckless activity. Concerns about safety are consistently nominated by non-cyclists as their primary reason for not riding. Considering that governments are intent on telling us that “the big fall” is inevitable, then people could certainly be forgiven for simply avoiding bikes altogether. After all, a crash might result in all sorts of other non-head injuries, which a helmet can’t prevent. The Australia media, too, gets significant mileage out of stoking public fears about the safety of cycling. This week, Melbourne newspaper The Age quoted an emergency physician who opined that riding a bicycle on Melbourne’s roads was “verging on suicide” – an almost hysterical assessment of the risk. Misconception 2: Cycling without a helmet is dangerous, but cycling with one is safe. This is the line that transport authorities would like us to believe (and one which many cyclists in Australia do believe), but unfortunately it is not consistent with the evidence to hand. For a dangerous activity to be rendered safe by the use of protective equipment, the safety device would need to be able to reduce or eliminate all or virtually all of the danger – which helmets certainly do not do. The effectiveness of helmets in the event of a crash is a hotly disputed topic. Most researchers agree that helmets will prevent some types of head injuries in the event of a crash (estimates generally claim anywhere between a 15% to 70% reduction in head injuries), however no-one claims that a helmet will prevent all head injuries or even anything close to 100%. Australian government cycling fatality data provides a sad illustration of this fact – between 1991 and 2004 over 60% of cyclists killed in Australia were wearing helmets at the time of the crash, a figure not much less than the overall helmet wearing rate of around 70%. Furthermore, head injuries are not even the most common form of cycling injury – clearly a helmet will not prevent a broken arm or collar bone. So if the two opinions above are an incorrect assessment of the risk involved in cycling, what is the correct one? Just how dangerous is cycling? The reality is that riding a bicycle is a safe activity. The following table shows Australian government data on the relative injury risk of a number of sporting and recreational activities. Compared to other activities that many Australians would not consider excessively risky or dangerous, cycling poses a very moderate level of risk. It’s interesting to note that helmets are not compulsory for either horse riding or roller sports, despite having injury rates around 7 times greater than for cycling. Cycling fatalities tend to represent between 2.0 – 2.5% of the annual road toll in Australia, which is not a disproportionate amount based on a cycling modal share of 1.5 – 2.0% plus some amount of sporting / recreational use which does not show up in transport statistics. Unfortunately, despite the evidence, governments continue to portray cycling as unusually dangerous – which is a necessary element of justifying our position as one of the few countries in the world with mandatory helmet laws . Once it becomes clear that cycling is actually a safe and healthy activity, even without a helmet, people will naturally question why it should be illegal for Australians to ride helmet-free like cyclists the world over. Although it’s clear that cycling is not an intrinsically dangerous thing to do, there are certainly situations in which it is risky to be on a bike – serious accidents can and do occur. However there is one very obvious “risk factor” for serious cycling injuries – and it is not failure to wear a helmet. Over 90% of cycling fatalities are the result of a cyclist being hit by a motor vehicle. If we want to reduce the effects of these types of accidents we need to address the cause the injuries themselves – the destructive capability of the motor vehicles. The way to reduce cycling fatalities is not to accept that these accidents will occur and insist on universal helmet use – it is to reduce the likelihood of these accidents happening in the first place. Irrespective of whether cycling is dangerous or not, helmet use does not alter the risk profile sufficiently to make a dangerous situation safe, despite what helmet law supporters would like everyone to believe. The most generous estimation of the benefits of helmet use might hold that they reduce the chance of mortality or serious injury by 50%. (70% reduction in head injuries, where head injuries make up 70% of all serious or fatal injuries). If the risk of a serious injury on a particular trip is significant, perhaps 1 in 100, it is not irrational to believe that reducing the risk to 1 in 200 has now made the danger insignificant. At the other end of the scale, when the risk of injury is very small, even doubling that very small risk does not turn it into a major danger. For example the average fatality rate for bicycle use (for travel as well as for sport and recreation) has been estimated to be something around 0.5 deaths per million hours of cycling on average (although it varies from country to country). For a 30 minute trip, this corresponds to a 1 in 4 million chance of being killed. Wearing a helmet might improve your odds to 1 in 8 million – but again it would be irrational to argue that 1 in 8 million represents a perfectly safe and acceptable level of risk, while 1 in 4 million is reckless and dangerous. In either case, the absolute level of risk is extremely small, as is the marginal benefit of wearing a helmet. This is not to say that it is irrational for an individual rider to want to wear a helmet in some situations or even all of the time – of course that is perfectly reasonable. Risk tolerance is a subjective matter. However it is not logical or rational for our governments to continue to impose laws which make it compulsory for all cyclists to wear helmets in all situations. Mandatory helmet laws have not made cycling in Australia safer than places without them (the Dutch boast the best cycling safety record and have achieved this with no helmet laws and a very low rate (<1%) of voluntary helmet wearing) but they have succeeded in marginalising cycling and fostering the impression that it is a far more dangerous activity than it actually is. Follow us on Twitter (@freecyclists) and like us on Facebook and spread the word. You don’t have to be in a country burdened by bicycle helmet laws!